Seriously Sharp will turn a cheddar lover into a cheddar enthusiast. Brace yourself for the intensely tangy, nutty and complex flavor that this cheddar has to offer. Simply put, this cheese is not messing around. It has a dense and slightly crumbly texture. Redolent of the grassy, clover covered fields of the North Country, we like to savor it with full-flavored ingredients like smoked meat and spiced chutney. This is the cheese that will make a box of macaroni weep with joy or your fondue pot go weak in the knees. It is the cheddar that bites back. All cheddar made from cows' milk is naturally white, the color of milk. 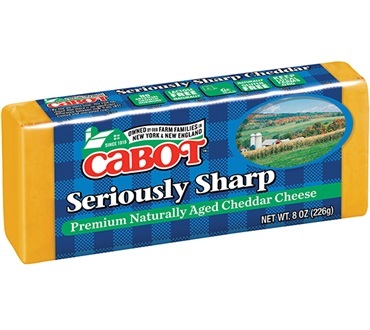 However, as Cabot's distribution expanded, it became more important to provide orange or yellow cheddar. Some say this preference dates back many centuries to when cheesemakers tried to match the exact color of cheddar from Cheddar, England. Regardless of preference, we use a coloring called annatto. Annatto is from a South American plant and does not affect the flavor or the texture of the cheese. Love the tomato and basil flavor! I enjoy a few pieces as a snack. It tastes great alone or with a few small crackers. After viewing Christmas light displays, we returned home and enjoyed our cheese and salami with German brochen (rolls) and butter.